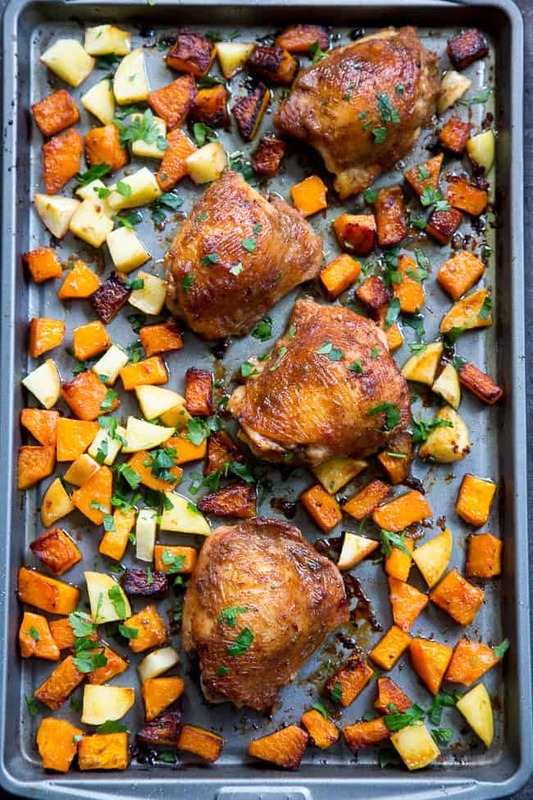 This savory and sweet glazed sheet pan chicken with butternut squash and apples is the perfect no-fuss, one-pan paleo and Whole30 dinner. With a date-sweetened glaze, it’s free of added sugar but packed with flavor and kid approved! I’ve never been too keen on sheet pan dinners. Yup, that’s the big honest secret. And no, it’s not because I like making things hard on myself or have something against turning on my oven (it’s on more often than it isn’t) but rather it’s simply because I just didn’t think the outcome tasted all that great. I was thinking inside the sheet-pan box, trying to follow “the rules” (what rules?!) and not getting the least bit creative with sauces, spices, oven temp and timing, you know – everything involved in cooking!! I’m pretty sure I was just being stubborn about the entire thing, and not giving my sheet pan dinners a fair chance. And by “dinners” (plural) I’m referring to all 4 that I made in my entire lifetime. You see, I never, in fact, gave the sheet pan dinner a fair shot with real effort. I’m not sure what changed my mind exactly. Okay never mind, I’m remembering now. My daughter Emily wanted to make homemade baked fish sticks from her own recipe book, so we gave it a go together. Anyway, the outcome was great – my kids LOVED them – and they came out all nice and crispy golden thanks to the high heat and oil combo. That’s when I realized that 1.) 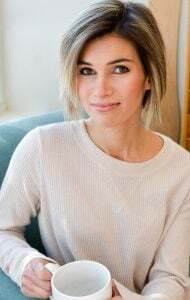 I need to attempt paleo fish sticks and 2.) That maybe a sheet pan dinner would benefit from this method. 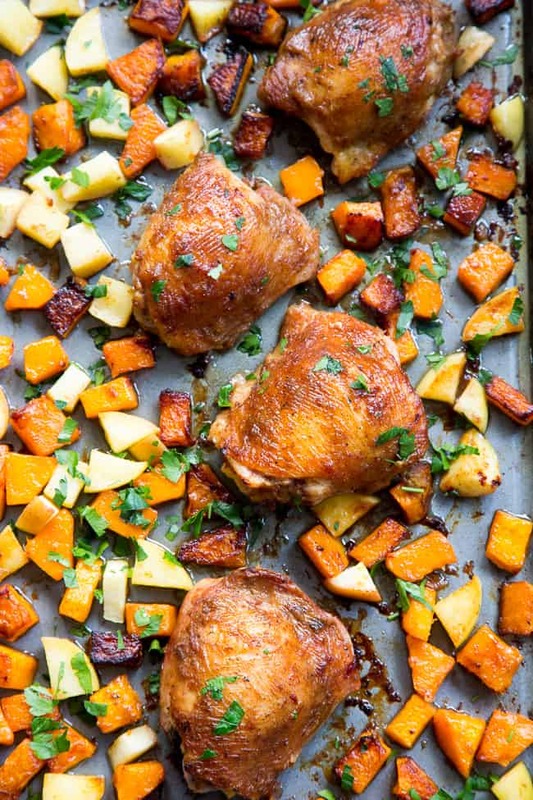 Enter my glazed sheet pan chicken thighs with butternut squash and apples. Yes, this is sort of “fall” themed even though we’re smack in the middle of February, but I could always go for butternut squash and apples no matter the season! To fancy up the chicken, I decided to create a Whole30 compliant sweet-mustard glaze using dates, spicy brown mustard, lemon juice and cinnamon. The oven temperature is nice and high to get the chicken skin crispy and the butternut squash caramelized without burning it or turning it to mush. The apples are roasted only at the very end, to soften them and bring out the maximum level of natural sweetness! 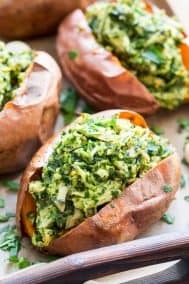 It’s a simple, kid friendly Whole0 and paleo dinner option that makes the best of the ingredients used. 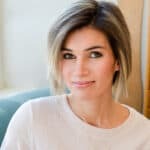 I hope you’re ready for an easy, delicious and healthy meal – get the oven preheated – let’s go! 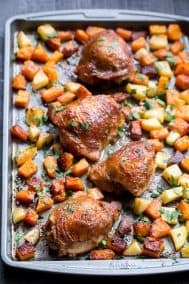 This savory and sweet glazed sheet pan chicken with butternut squash and apples is the perfect no-fuss, one-pan paleo and Whole30 dinner. With a date-sweetened glaze, it's free of added sugar but packed with flavor and kid approved! Preheat your oven to 450 degrees and coat a large baking sheet with 1 Tbsp of the oil. Position oven rack in top portion of your oven. In a large bowl, toss butternut with remaining coconut oil and sprinkle with salt, toss again to evenly coat. Once your oven reaches 400 degrees, put your empty sheet pan in the oven. 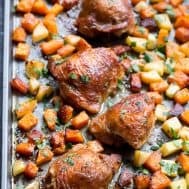 When oven reaches 450, carefully remove sheet pan (it’s hot!) and place chicken thighs on it, skin side up, and sprinkle all over with sea salt and pepper. 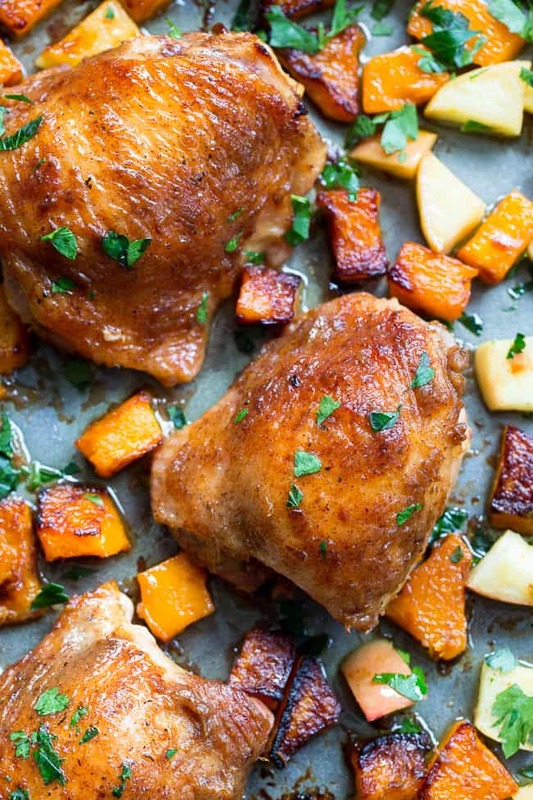 Arrange butternut squash all around chicken in a single layer. Roast in the preheated oven for 20 minutes, meanwhile, make the glaze. In a high speed blender or food processor, place all sauce ingredients and blend until very smooth. After first 20 mins, remove sheet pan and brush about 1/3 cup glaze all over the chicken, using tongs to turn if necessary. Brush some of the oil/rendered fat on top, and lightly stir the butternut. 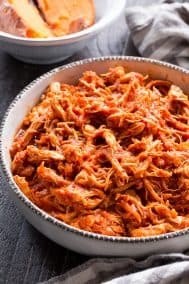 Return to oven for another 10-15 mins, remove, brush remaining glaze over chicken along with pan juices and add the apples to the pan, placing in a single layer. 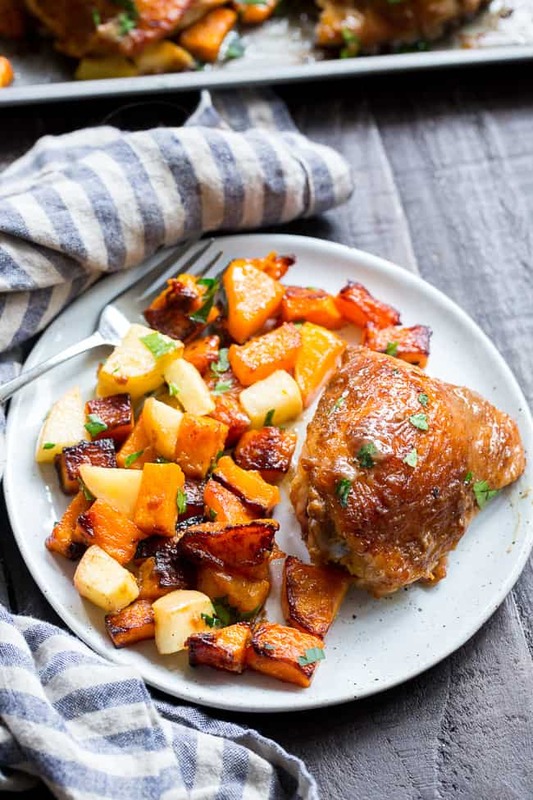 Roast for another 10-15 mins or until butternut is caramelized, apples are fork tender and chicken is cooked to an internal temp of 165 F. Serve hot and enjoy! I love that fish stick method! 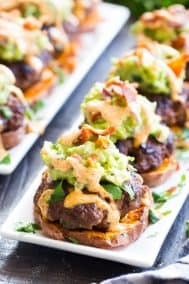 I would be so happy if you came up with a tasty Whole30/paleo version! My kids are on me for that one! 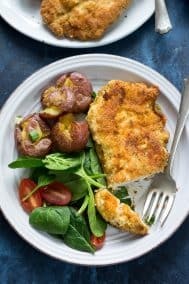 I am planning to make this tonight but I don’t have any bone in thighs, would this work with breast or tenders? Both boneless and skinless? And how would you adjust temp? 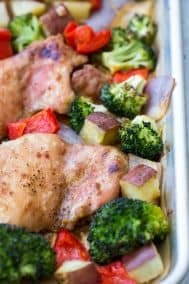 I love sheet pan dinners, they make my life so much easier! Thanks for solving my what’s for dinner problem! The boneless skinless chicken won’t need nearly as much time baking, so you can add it probably 15-20 minutes into the baking time (for the butternut) I’d say. Can you sub sweet potatoes for butternut squash without changing any of the cooking steps? Couldn’t you just use the chicken schnitzel breading for the fish sticks? ? been wondering to try that myself. Not sure, it’s still on my list of things to try! I loved this dish! I used dijon mustard instead of spicy brown because my don’t kids like the taste it and it turned out great! Such a tasty combination of flavors! 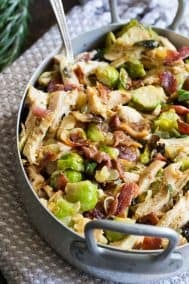 We had it with roasted brussel sprouts and bacon. YUM! I can not stand mustard. Is there anything I could use as a replacement? Yes this is nice and enjoyable. visit me for more amazing posts. The food was delicious and attractive, I just wanted to eat it. This is AMAZING. It was so easy and I’m literally moaning while I eat it (soooooo good). Even the kids ate the chicken. SOOOO good. These flavors are incredible! This was delicious. It was the perfect meal for our cool weather. It makes me want to eat roasted butternut squash more often. We are doing a Whole 30 and this was perfect! 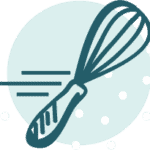 Of course, I haven’t made a recipe yet from your site that hasn’t been wonderful! Thanks! 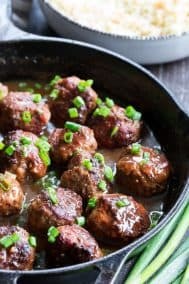 This is a great and easy recipe to use!!! Tried it last night and used chicken drumsticks and some different veggies(yellow potatoes sliced, red peppers, carrots and halved cherub tomatoes.) The chicken was so moist and the veggies delicious.